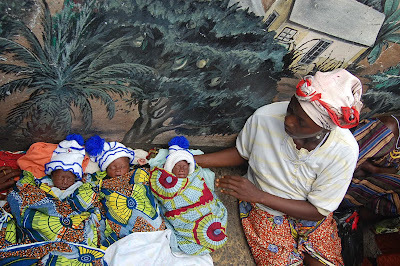 Nazareth House Apostolate Blog: Triplets in Freetown! 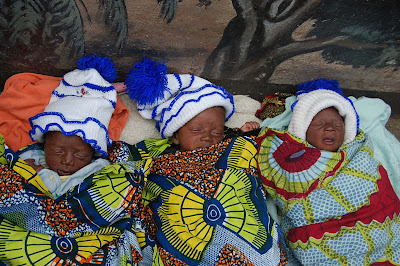 Triplets in Sierra Leone are a rarity. We pray for their survival. I came across this mother, named Mabinty from Temne Tribe, downtown today begging for survival for her three beautiful girls. They are very tiny. A young girl in Kabala recently gave birth to three like this poor lady but two died a week later. They could not get the right care and am afraid for these as well, too. One of them was sick and the mother was crying for help there. Few people gave little coins. I gave a little too and want to send these pictures to you. Guess you are busy. Any word on Nancy?? NOTE: James is referring to Nancy, the Sr. Warden of Grace Church in Louisville who is very ill.